Learn how you can take advantage of Amazon’s recent AWS marketing push, and leverage being “Powered by AWS”. Impress clients and customers by running your business on the same technology that is powering applications for Major League Baseball! Amazon Web Services ads during MLB Postseason. Another historic World Series is in the books, and the Boston Red Sox have walked away with the trophy once again. This MLB postseason was highly entertaining for everyone. Whether you were a Red Sox fan enjoying the victory, a Dodger fan wondering where it all went wrong, or just a fan of baseball in general. One noticeable addition to the action during this MLB postseason was the “Statcast AI powered by AWS” campaign. These spots during the game highlighted interesting situational statistics and data for the viewers at home. In addition to these fun stats, fans also got to hear Joe Buck proclaim before each clip that MLB Statcast was “powered by Amazon Web Services!”, in his perfect announcing voice. 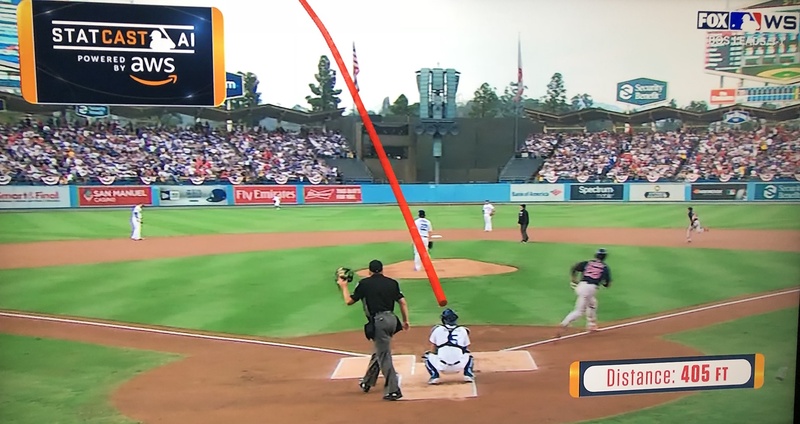 Although they spare all the details of HOW Statcast AI is run on AWS, more everyday people are now aware of AWS after these advertising spots. People who may never have been exposed to cloud computing, now know that AWS is a powerful tool trusted by big businesses like the MLB. Amazon’s recent marketing push for AWS. During the rise of AWS (and cloud computing in general) over the last 6+ years, advertising for AWS could barely be found. Sure, you would see billboards in the airport during IT trade shows. But you’d never see ads aimed at mainstream consumers. Advertisements were targeted only to the true cloud IT nerds, that worked with AWS on a regular basis. Last year, when I was arriving at Amazon’s annual Re: Invent conference in Las Vegas, I jumped in a cab to my hotel from the airport. The driver alerted me that the Amazon.com convention was in town (or so he thought). The driver proceeded to wonder why Amazon.com would put on such a large convention in Las Vegas. I tried to explain to him how AWS powers most of the internet. I don’t think it stuck when I proclaimed how Amazon’s dominance goes beyond online retail. In the last year, AWS has noticeably made a big push in advertising aimed at the mainstream. They have released commercials telling people to “Build On AWS”, and made their presence known during prime time MLB games with MLB Statcast AI. Due to this push, many people now are semi-familiar with the powerful cloud computing that AWS offers. Multiple benefits of being “Powered by AWS”. Hosting a business website or blog using WordPress and Amazon EC2. Running an OpenVPN server to your resources via Amazon EC2 and Amazon VPC. Securely storing mission-critical backups and information in Amazon S3 and Glacier. Using AWS WorkSpaces to give employees a secure virtual desktop to work on. Running web meetings and voice dials through Amazon Chime. Any business can be “Powered by AWS”, and reap the benefits of all the powerful technology AWS offers. Letting your customers know that your business is “Powered by AWS” can be a big advantage. It shows them you are on the cutting edge of technology, just like the MLB! AWS on full display during Game 7 of the World Series. The AWS marketing push is making Amazon’s cloud computing division a household name synonymous with advanced technology. Right now is a prime opportunity to utilize AWS in your business, whether it’s running your own websites, applications, or services on AWS, or offering AWS solutions B2B as a service provider/freelancer. When customers see that you are “Powered by AWS”, you’re credibility will go farther than a home run by Steve Pearce! If you want to learn more about how to build and grow small business tech with AWS, subscribe to my newsletter below! We promise to never spam you, and you can unsubscribe at any time.